MacLean, 2013 graduate of Bucknell University graduated with dual degrees in linguistics and education. As a member of the Bison squad MacLean worked her way to the record books during her 4-year campaign. She is ranked with 3 spots on the program’s top-10 career lists including games, starts, wins, shutouts and innings pitched and holds 9 spots on the program’s top-10 single-season record lists including games played, starts, wins, shutouts and strikeouts. MacLean was named Rookie of the Year and Patriot League Tournament MVP her freshman year when she helped the Bison to their championship win against Colgate in 2010. In her senior year she was named Lee S. “Bud” Ranck Memorial award for outstanding spirit and contributions to Bucknell athletics. Alex is the owner of 7 Deadly Spins Fastpitch, LLC. Contact Alex at: operations@7dsfp.com or call 610-597-6099. I knew the Tincher name for many years before I decided to reach out to Denny to learn more about his program. I needed to know what Fluid Dynamics was and why it was so successful. I read all of the testimonials on the website and knew they must have been doing something right if they had so many pitchers playing at the collegiate level. During my first training with Denny Winchester, Virginia I was hooked. Denny’s extensive research to develop Fluid Dynamics was impressive. A lot of the questions I had I got answers to, and I learned techniques to help my students overcome the challenges we were facing. It was just what I was looking for and I was excited to take Tincher Pitching home with me to the Lehigh Valley. After implementing Tincher Pitching’s Fluid Dynamics into my training regimen with my pitchers the results were amazing. Kids with shoulder and back pain were suddenly pain free, others who had plateaued added several miles per hour and most of all pitching felt powerful and relaxed. Here is what Denny says about Alex: We absolutely love Alex because she is so obsessed with doing things exactly right with her kids. The first few times we talked, she challenged me and I was not sure she would join our group. She wanted to make absolutely sure that our methods would work and she wanted the freedom to experiment and develop new and better ways. That is who we are, and I knew she would eventually be one of us. This kid is going to be one of our great ones! She asks the right questions, studies the kids carefully, and has a way of pushing to heights they never considered. “With two daughters that range from 10 & Under to 14 & Under it is great to have found a pitching instructor who has gone through it all herself. Basic pitching mechanics, drills, advanced pitching technique and fitness and conditioning exercises can all be shown. After just 4 lessons over two weeks my daughter Jade, with a lot of help from Alex, was able to turn her curveball from a lost pitch back into her strikeout pitch. Thank you, Alex! Savana (my daughter) and I feel so lucky to have found Alex. Alex Maclean is a positive role model as well as an outstanding fastpitch athlete. Primarily, Alex is a master of her craft. She has lived and excelled at what she teaches. She is a genuine person and works to develop a positive connection with her students; as a parent I love that. As a single father, I love this ‘girl power’ connection that Alex brings to the relationship. 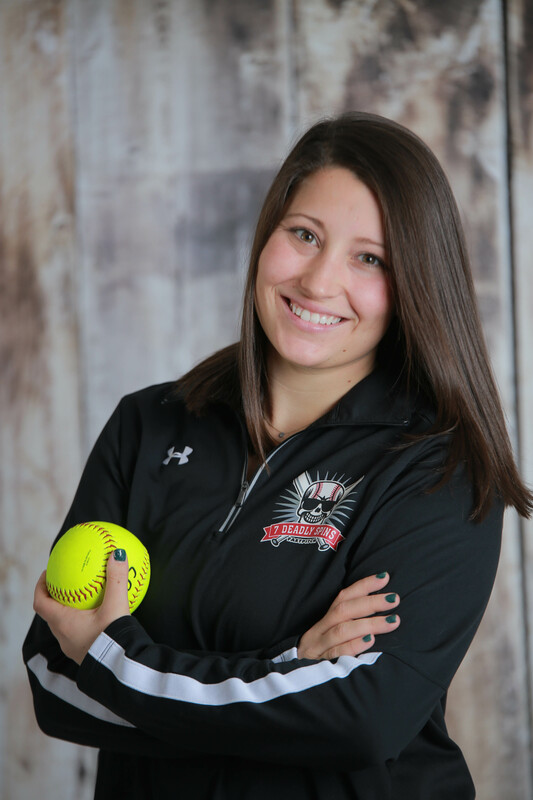 Alex is a cerebral athlete and teaches the entire sphere of pitching, hitting and playing fastpitch softball, including the physical, mental and emotional aspects. I also appreciate that Alex is a driver, sets the bar and expectations high, gives homework and makes Savana accountable for her work. Alex is a great pitching coach.It only took my daughter 2 weeks to learn the Tincher style of pitching. When she went to the Tincher style of pitching my daughter picked up at least 7mph on her fastball and has more movement on her fastball. Her drop ball works great as well; she fools a lot of batters with it. The way she taught my daughter how to throw the curve ball she could throw all day long without injuring her selfMy daughter is a left handed pitcher. Her change is about 10mph slower than her fastball. Alex is great about paying attention to detail she could get your daughter to throw 2 to 3 mph in one lesson. Alex explains her coaching that the pitchers can understand her. She will be a great coach for your daughter. Thank you for your help with Valerie. Her pitching has greatly improved. I appreciate you pushing Val to train harder. Regan is very confident you will provide her with everything she needs to self correct. Thanks again Alex. It’s so nice to meet someone with such a great spirit. You have such positive energy and it’s refreshing. Thank you for your commitment to my girls. I am so excited to see the results! We definitely want to continue with you. I am so proud of Hannah. It is your coaching, Alex. No one has ever had the influence you’ve had on her. It’s been so amazing to see as her mom! Her dad and I do all we can but having you help guide her has been huge. Hannah worked very hard, this past week doing her drills. She has confidence and threw a no hitter today! Thanks a billion for your help and encouragement! Absolutely awesome clinic today! I even learned a few things. Denny Tincher is great guy. I would love for him to visit again in the future! Thanks, Alex! Cailey is so excited, she can’t wait to pitch at practice tomorrow. This is exactly what she needed. After Emily’s lesson last night with Denny and this morning with some of the other girls on my team interested in pitching, I am more than impressed with his knowledge and approach. I am so glad we are with you and not some guy trying to apply mens fastpitch to girls! I look forward to watching Emily progress through your guidance. Kristen was extremely happy after the session with you and Denny this weekend due to the fact that she was able to pitch with no pain. I cannot express how excited she was that she was able to go through the clinic at all. Her confidence was extremely high and it showed when she pitched in a game on Monday. Both her and Morgan drew their reminders on their arms and leg and I have to say she pitched a great game, more importantly without pain. This is exactly what we were looking for when we came to see you and I personally appreciate it! No one has ever had the influence you’ve had on her! It’s been so amazing to see as her mom. Her dad and I do all we can but having you help guide her has been huge! Just wanted to tell you Rach pitched her first full game “ALEX STYLE” this morning. Previously she would struggle and revert back to open/close….but not today!!! We have crossed over AND she did great, pulled out the win 5-0 and got MVP. We love Alex. She helps her pitchers improve their mechanics and their mental game. She’s genuine, loves what she does and will be your daughter’s biggest cheerleader. My daughter just started with Alex last month and it’s already made a difference in her pitching and attitude. I think Alex is wonderful. My daughter has been working on pitching for a few years now, and she has had a few different pitching coaches; but she always struggled. Everyone, wether a pitching coach we hired or her team coach gave her different instructions, they would confuse her, they would always want to change what the other was teaching her. With Alex she has learned more than ever before in a short amount of time. Her coach is pleased with her process and has agreed to let Alex coach her pitching. He has even come to a practice at Alex’s invitation and was very happy with the way it went. Alex has a way of teaching my daughter that she understands and in return works hard at it. My daughter has improved INCREDIBLY and most importantly she enjoys pitching lessons. At one lesson my daughter was not focusing and wasn’t showing improvement and Alex told her nicely “I will not take you parents hard earned money if you dont want to do this or if you are not willing to put you all into it”…the next practice my daughter showed what she needed to. She had improved and was focused. My daughter realizes that although softball should be fun first, she needs to work hard and focus on her goals and not waste everyones time and money…what a great lesson for a coach to teach a child. My Daughter started going to Alex and 7 Deadly Spins Fastpitch a little over 4 months ago. After hearing about Alex and this thing called Tincher Pitching from a friend of ours, ,y Daughter and I decided to go and sit and watch a Lesson. A Decision and Choice we are so glad we made. My Daughter was hooked from the first time she Met Alex and so was I. My daughter has been pitching for a couple years and was now moving up to 12U. In the blink of an eye she went from never even pitching a day of 12U to being a 14U tournament pitcher. She was nervous as was I about making this transition. We sat with Alex and explained the situation. She spoke to my daughter and explained to her if this is what she wanted she would get her there as long as she was willing to put in the work. From that point forward I have watched the change in my daughter. The passion for a position she loves and the dedication she is putting forward. Now working with someone who pushes her to be better and work harder. We look Forward to many more years working with Alex and 7 Deadly Spins Fastpitch. My daughter has been going to coach Alex for 3-4 years now. I definitely see the improvements she has made in these past years. She loves Alex and in the past year has really been working hard on these new techniques that Alex has been teaching. I ve noticed more power behind her pitches and I can definitely see the power from the laces I get on my legs from trying to catch for her. Thanks for all you do for her and for being there to answer her questions no matter when she texts. My daughter just started with Coach Alex and already we are seeing great things happening! She immediately started to see a few areas that needed improvement. My daughter was not convinced after the first lesson but agreed to go for one more…. After the second lesson, she is sold! Coach Alex is an expert in her field! She has a wonderful way of working with kids and getting them to listen to her instruction in a fun and interactive way. I would recommend this program to anyone who is serious about pitching! Alex has an infectious enthusiasm for softball and pitching. She loves what she does and it shows. Becca has gained speed, accuracy and confidence with every passing lesson. Thank you Alex for your commitment to all our daughters. In late spring of last year Mady began to experience some back pain while pitching. At first it seemed to be minor but over the course of the next few weeks the pain increased. We took her to our doctor who recommended rest and for her to take some time off from pitching. The rest aspect was easy, but if you know Mady she is extremely passionate about pitching. We began to research and learned more about how back pain for pitchers can be related to their mechanics. We tried some different approaches with her pitching coach but she did not experience relief from the pain. We made the tough decision to try a different coach. After speaking to several pitching coaches we were fortunate to find Alex. Our first conversation was eyeopening and we knew that we wanted to have her meet Mady. The first inclination that we made a wise choice was how booked Alex was at the time. That made us feel that she was in demand for a reason. From the moment Mady met Alex there has been a bond. As a father, I truly enjoy working with my daughter but know that she is reaching a level where fully turning her pitching over to a coach who has achieved a very high level of success was needed. Over the past 6 months Mady has made incredible strides in not only her technique but had matured as an athlete and young women. I am convinced that Alex has played a big role in this development. Her pain is gone and we love Alex so much that we’ve recommended her to several other pitchers who all have had great experiences with her. If you are looking for an amazing pitching coach who will work to develop your daughter I highly recommend Alex. One of the best decisions, I have made was bring my daughter, Kendra to Alex for lessons. Alex has helped my daughter with her form, speed, and consistency. Alex challenges Kendra to continue to work on the little things pitching as well as pushing her to get to the next level of pitching. Approximately, one year ago, Kendra was pitching on average 42-43 mph. She is now hitting 49-52mph and continuing to increase with each lesson. Kendra enjoys the lessons, at times Kendra may struggle during a lesson however, at the end of the lesson she continues wanting to come back to Alex because she believes in Alex and Tincher pitching style. As a softball coach, I find Alex to be an incredible pitching coach and possess abundance of knowledge, tools, strategies, and understanding of what it takes for young girls to become the best pitcher they can be. Alex is teaching and coaching my daughter so she can get to the next level of pitching.